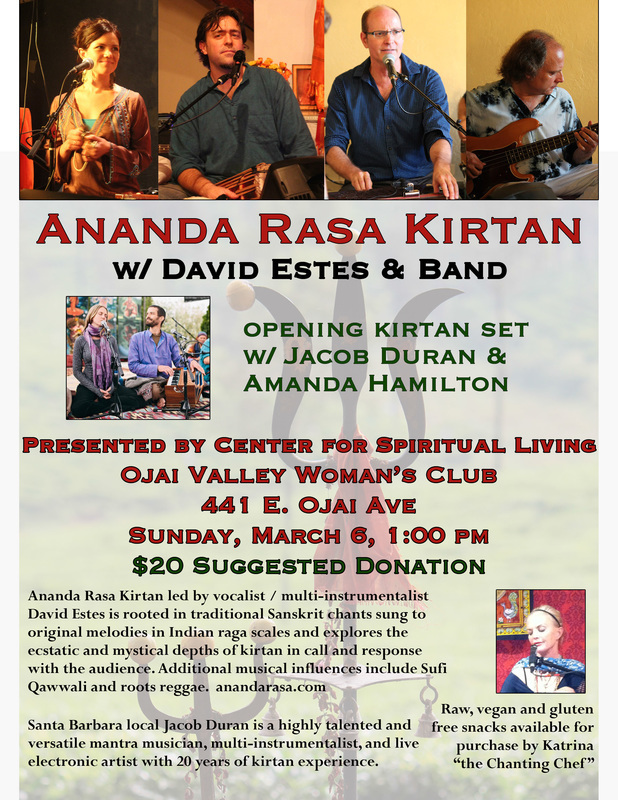 Kirtan Salon was launched with the phenomenal Ananda Rasa Kirtan with David Estes & Band at the Ojai Women's Center on March 6th, 2016! David Estes on Lead Vocals and Dholak, Greg Filler on Harmonium and Vocals, Greg Barnett on Bass and Damiana Carpizo on Vocals uplifted and rocked the house with their special blend of kirtan interlaced with bits of roots raggae and qawwali. The set was open with a powerful and moving kirtan with multi-instrumentalist Jacob Duran on Harmonium and Vocals joined by Amanda Hamilton. In addition to the kirtan, there were Art and Books by Marin County Artist Jennifer Mazzucco and delicious raw food items and pie by the Chanting Chef Katrina Machlachlan and fantastic kitchari offered by Guna. Read more..